The most suitable Muhurat is from - 11:10 - 13:37, the total duration of this auspicious time is 2 hours and 27 mins. Time to avoid Moon sighting the previous day (8.9.2013) is - 16:48 - 20:24, the total duration for this activity is 3 hours and 35 mins. Time to avoid Moon sighting on 9th September, i.e. the day of Ganesh Chaturthi is - 9:30 - 21:08, the total duration for this activity is 11 hours and 37 mins. We hope you will fetch the best of Ganapati’s blessings by following the above mentioned Muhurata (auspicious time). 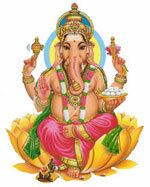 Ganesha is the Lord of beginning, wisdom and Intellect. Getting the blessings of Lord Ganesha will give you the power to accomplish any task. If there has been any issue bothering you, or if your are not able to get results no matter how much you try; then pray to Lord Ganesh and things will start seeing light. Hymn To Enchant The Lord ! Nothing can be good if it is not shared, likewise Ganesh Chaturthi is not fun if you don't wish your loved ones. A greeting card or simply a small SMS would make someone’s day; and why don’t you become the one helping in making this happen. As always, we are here to help you with that. 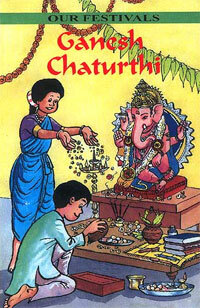 Ganesh Chaturthi is a very famous and one of the most widely celebrated festivals in India. Many processions and eye popping display of Ganesha idols will be there this Ganesh Chaturthi. Every year, thousands of devotees and tourists rush to participate in these celebrations. Mumbai is one city which is famous worldwide for its Ganesh Chaturthi festivities. 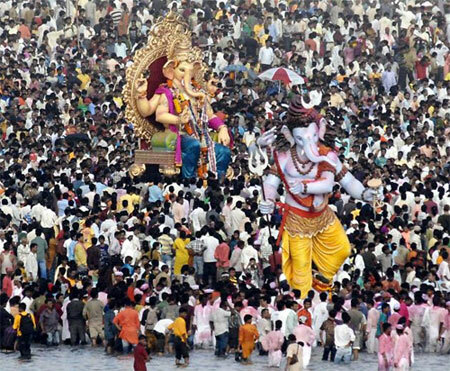 The Ganesha idols for display will be of record breaking heights and sizes. It is definitely a treat for the eyes to witness anything at such magnitude. Know The Right Time To Work Your Magic !